Cover each cardboard paper towel tube with foil. Lightly spray with non-stick cooking spray. Set aside. Sprinkle flour on a clean work surface. Slice cookie dough into 1/2-inch rounds. Lay on floured surface and roll into 3-inch circles. Place on your temp-tations® Lid-It®, sprinkle with cinnamon and bake for 7 - 9 minutes or until lightly browned. Remove from oven and immediately drape over the cardboard tubes. Cool completely and then carefully remove from tubes. 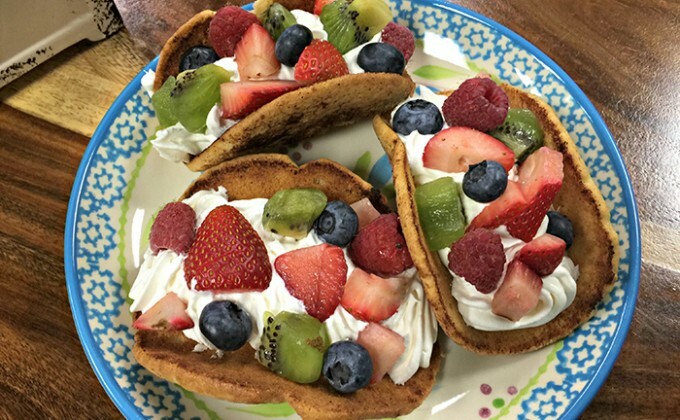 Fill each cookie taco with a dollop of whipped topping. Sprinkle with fresh fruit. Serve immediately.